Conservation of the massive remains of a 19th century iron works and colliery is currently being undertaken by Pembrokeshire County Council. In advance of conservation, detailed recording, including the production of stone-by-stone drawings of the major buildings is being carried out by Dyfed Archaeological Trust. To date, calcining kilns, an engine house and a revetment wall to the blast furnaces have been recorded. Currently, revetment walls to the calcining kilns are being worked on. 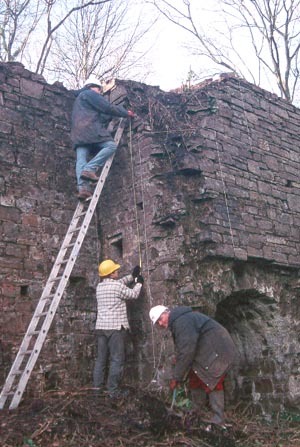 The conservation work is funded by the Welsh Development Agency and Cadw: Welsh Historic Monuments; W S Atkins are the consulting engineers and Taylor Woodrow Construction Ltd the main contractors.